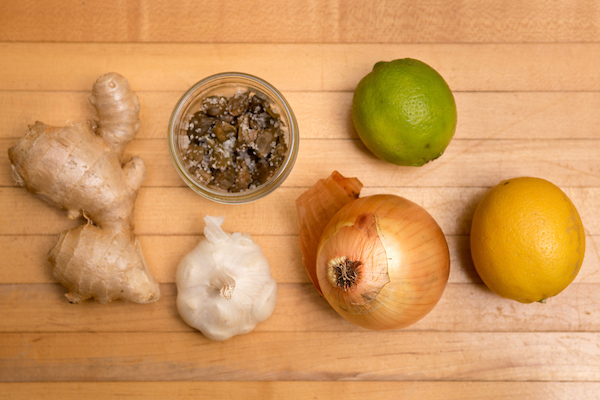 Lemons, limes, garlic, onions, fresh ginger, capers and anchovies and olives (not pictured) go a long way in enlivening most anything–produce or staple, you have on hand, and I always keep them in stock. I use a lot of citrus juice and zest in savory cooking as well as baking. A bit of acidity to finish things off is often the key to a lively dish. We all have our go to spices and dried herbs and condiments/sauces/pastes and the like. I always have Dijon-style mustard, whole grain mustard, mayo, ketchup, miso, various hot sauces, and a curry paste or two. Stock items that you like and think you’ll use often but I don’t find a need for too many condiments (I have lots more spices than shown above) since they clutter up the refrigerator and often don’t get used up. Pick one or two and see what suits your taste and cooking style. And if you have lots of fresh produce you don’t need a whole lot to make it shine. 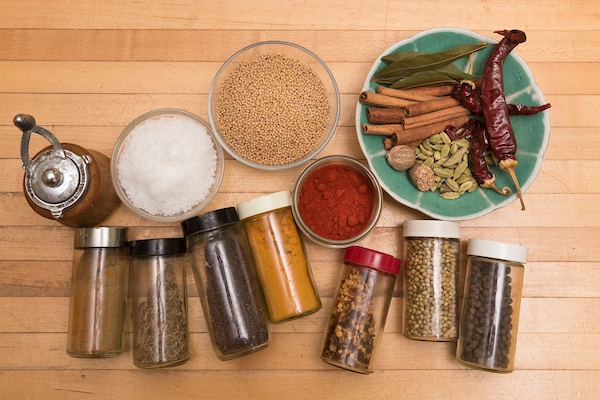 I like to stock some whole spices, like coriander, cumin, pepper corns, nutmeg, cardamom, bay leaves and cinnamon sticks and chilies since they are quick and easy to toast and then grind or use whole and add more fragrance than their pre-ground counterparts. Toasting and grinding your own spices takes a few minutes but if you have the time the flavors will reward you handsomely. Many cuisines–in particular Indian cuisine that varies widely from region to region–toast and grind spices in various combinations. 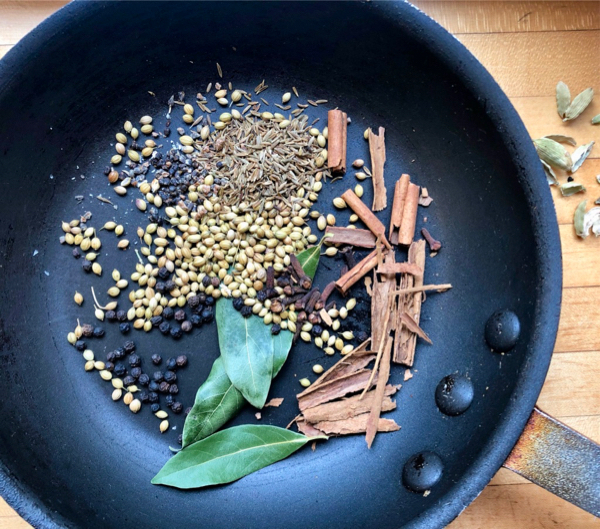 I use this garam masala for the Makhani Curry sauce and other dishes where you just want a little more flavor and complexity. Put all of the spices and bay leaves in a small, dry skillet over medium-high heat. Shake the pan to keep the spices moving around and toast them for about 90 seconds until the cumin and coriander are a shade darker, the bay leaves really brittle and everything smells very fragrant and toasty. The spices can burn very easily so don’t walk away. And as soon as they’re nice and toasty dump them into a bowl to cool. If you leave them in the pan, off the heat, they’ll burn from the residual heat. Cool completely and then grind in a spice grinder (I used a coffee grinder) until fairly fine. A little irregularity is fine. Store the spice in blend in a tightly sealed container for up to 3 months in a dark cupboard.